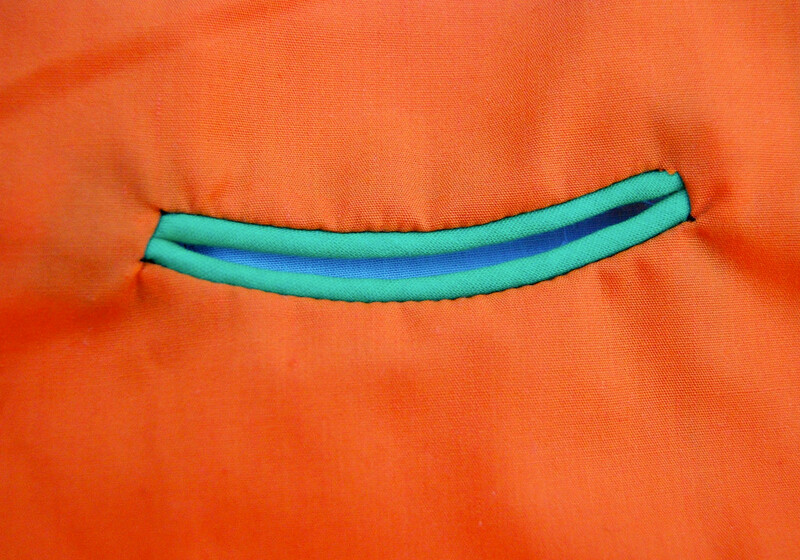 Thus far we've made bound welt pockets here and here whose lips are of the same fabric as the pocket lining and facing. A convenient short-cut, yes, but limiting, especially when you just want the lips and the lining to be of different fabric. 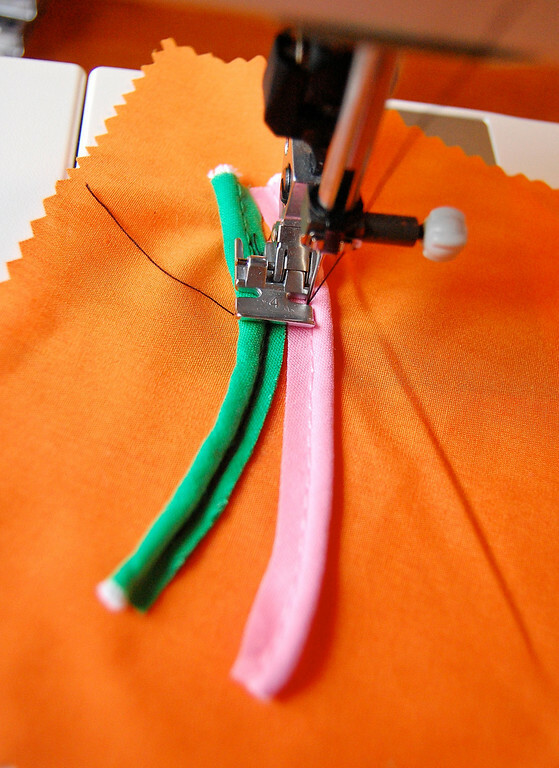 This tutorial introduces piping as the lips of a narrow welt pocket but you could just as easily use folded strips of fabric (next tutorial), interfaced to your liking. 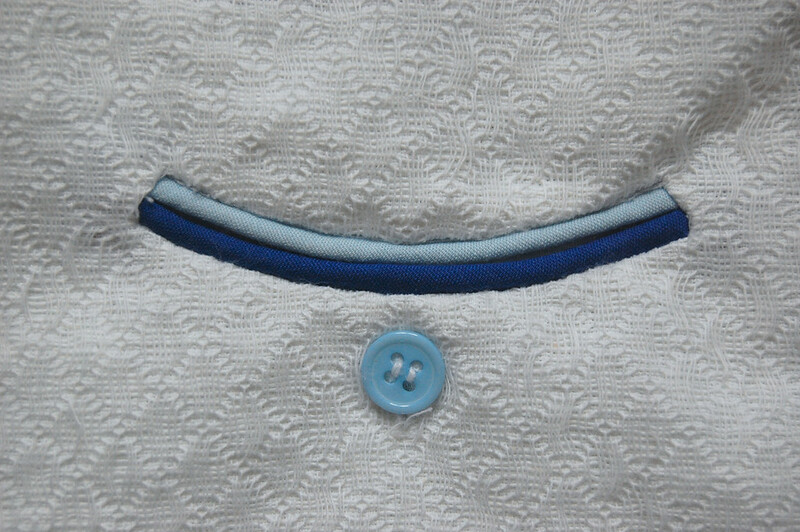 Obviously, with folded strips of fabric, even if cut on the bias, a straight pocket opening is easier than a curved one. piping (two colors will be used here for clarity). Draw the opening of the pocket. We've done a lot of straight-line rectangular openings, so this will be a curved opening, just for fun. I've drawn just the midline between the two lips, rather than the edges of the full opening. The piping should be longer than the opening. 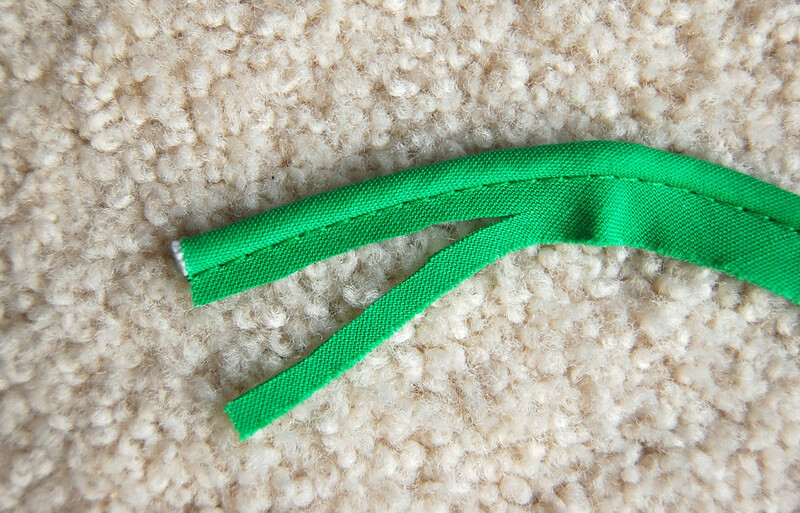 Trim the seam allowance of the piping to match the width of the piping cord. 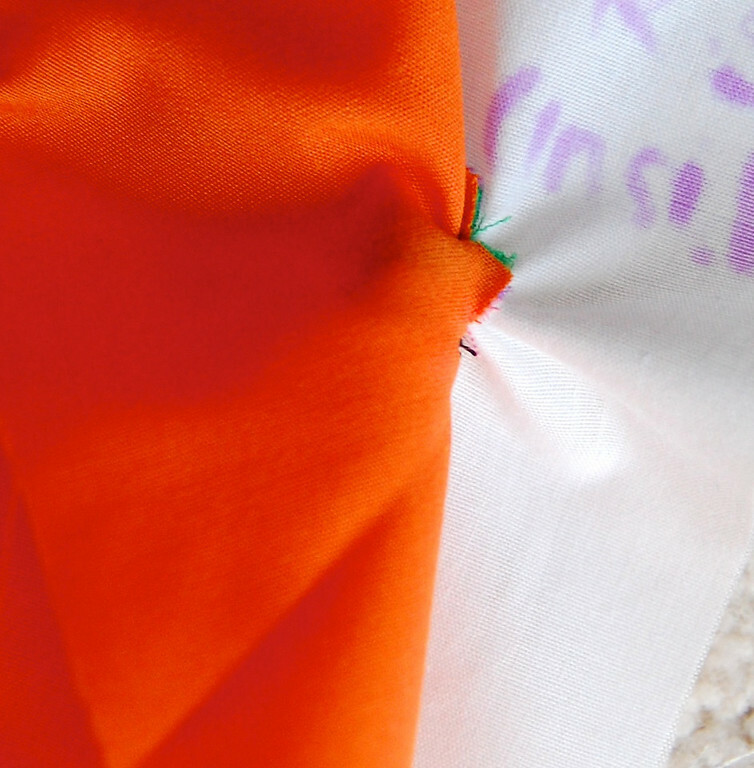 Line up the edge of the seam allowance with the line you drew in Step 1. 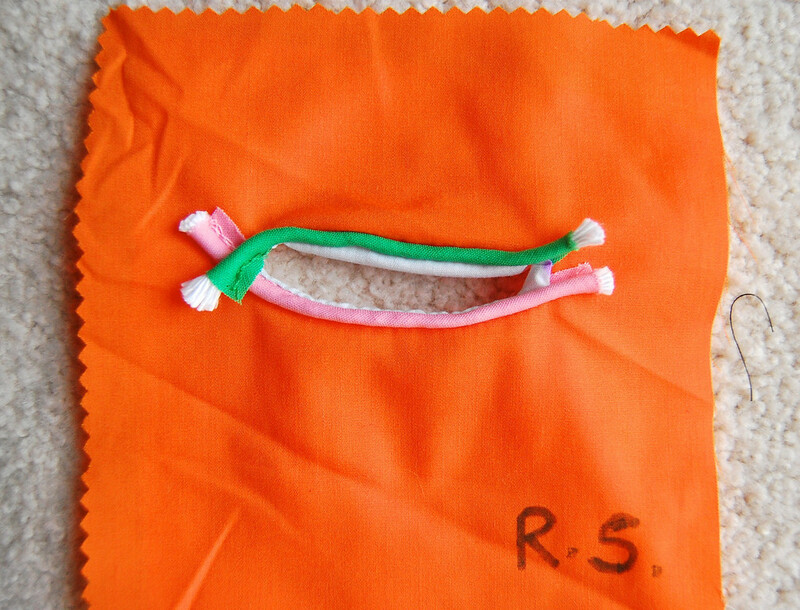 Using the zipper foot, (I don't own a piping foot) sew close to the piping cord, and only along the length of the opening. The excess piping on either end is left unstitched. Important: do not pull the piping taut as you sew it around the curved line. Feed it generously into the curve. There is a photo after Step 9 that shows the tragic outcome of ignoring this advice. Place the second piece of piping (pink) in position. The edge of its seam allowance should line up with the same line as in Step 3, but on the other side. So the two pieces of piping are parallel, with the edges of their seam allowances just touching on either side of the pocket opening line. 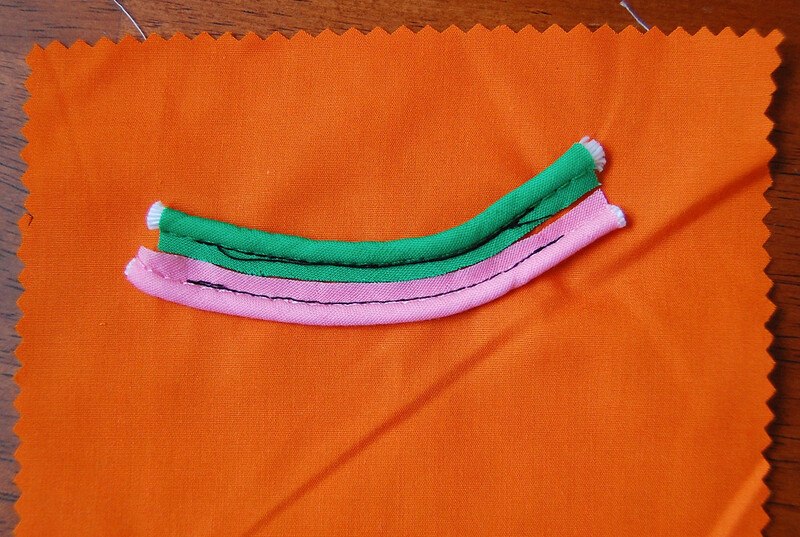 Sew close to the piping cord of the second piece of piping as you did the first piece (green). 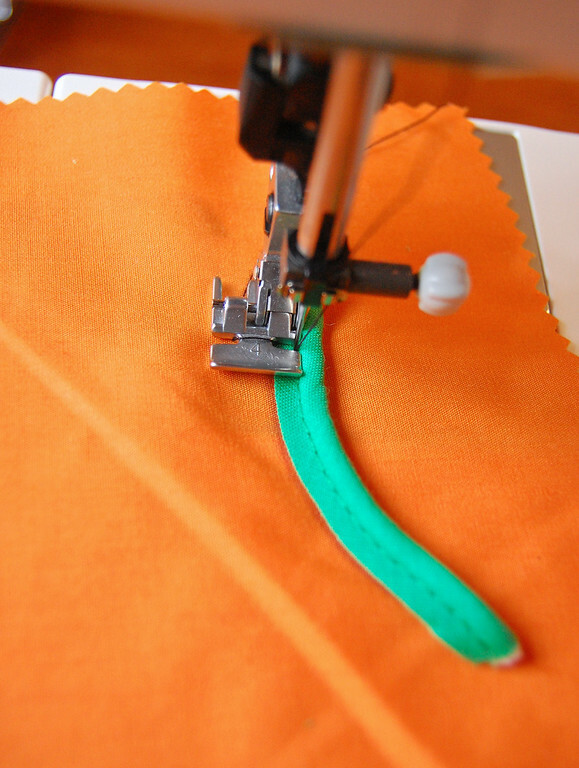 the stitching lines are the same length, and only span the length of the opening you drew in Step 1. 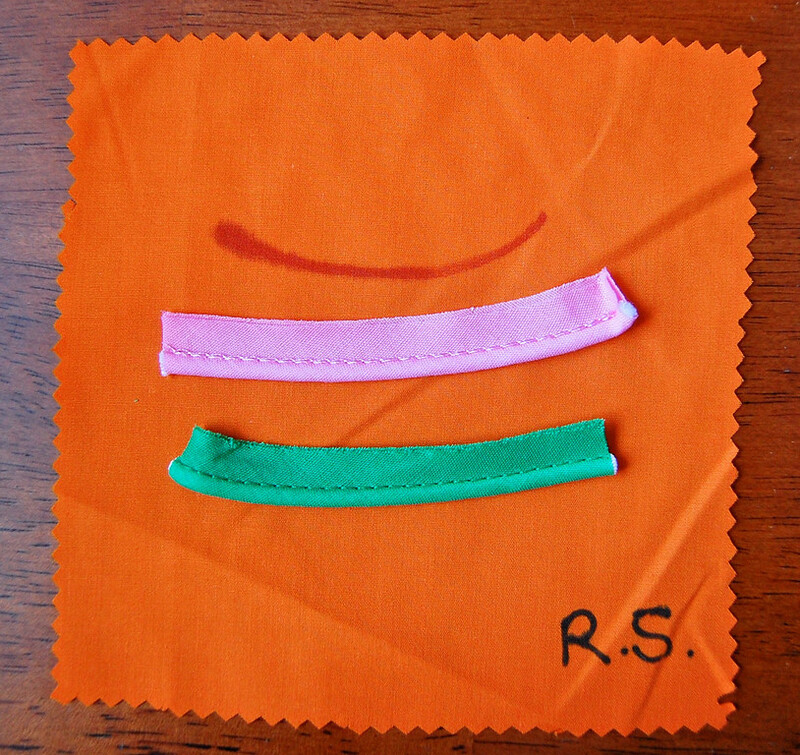 Here is the wrong side, showing the parallel stitching lines, both the same length. 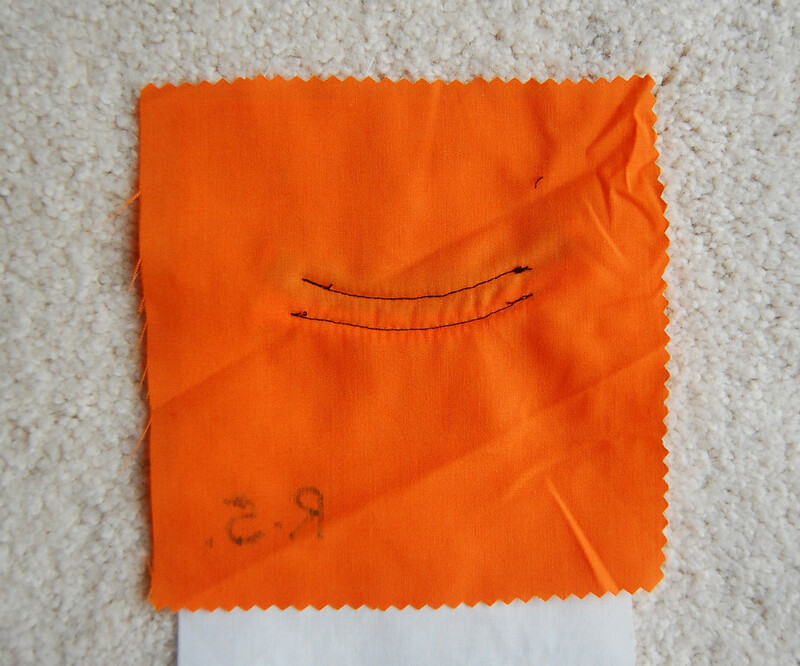 Position the facing piece against the right side of the garment and pin in place. 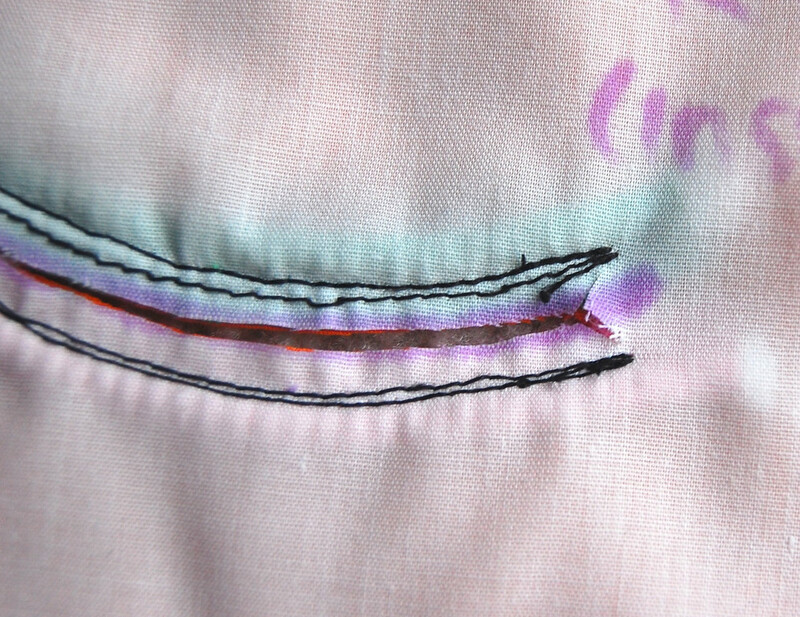 Sew (white stitches) exactly on the same stitching lines (black stitches) from Steps 3 and 4, to attach the facing to the garment. Cut along the line you drew in Step 1, making diagonal cuts to the corners. 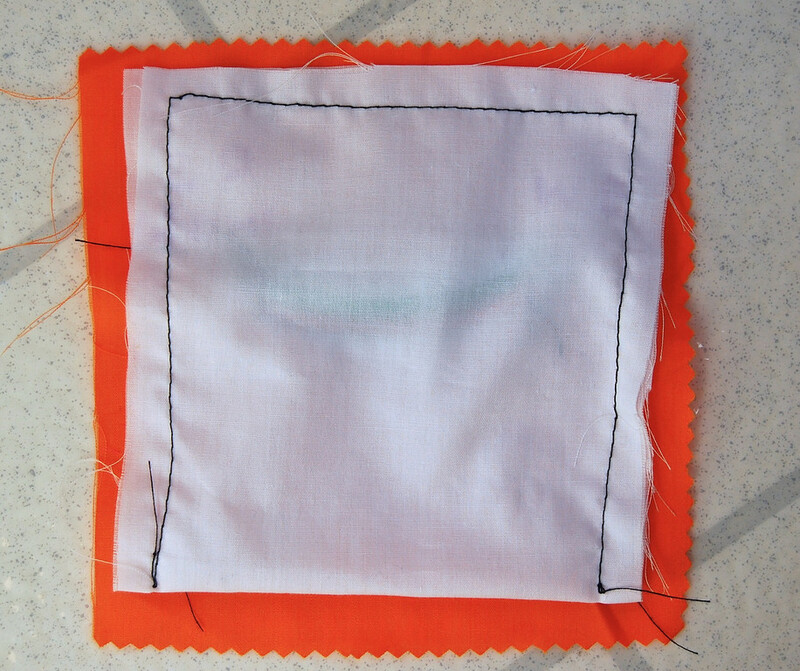 Here is an unrelated photograph of one of my practice pieces showing this cut along the midline of the pocket opening, and the diagonal cuts to the corners (I failed to take a photo of this step with the actual orange fabric). Pardon the misaligned stitching lines. 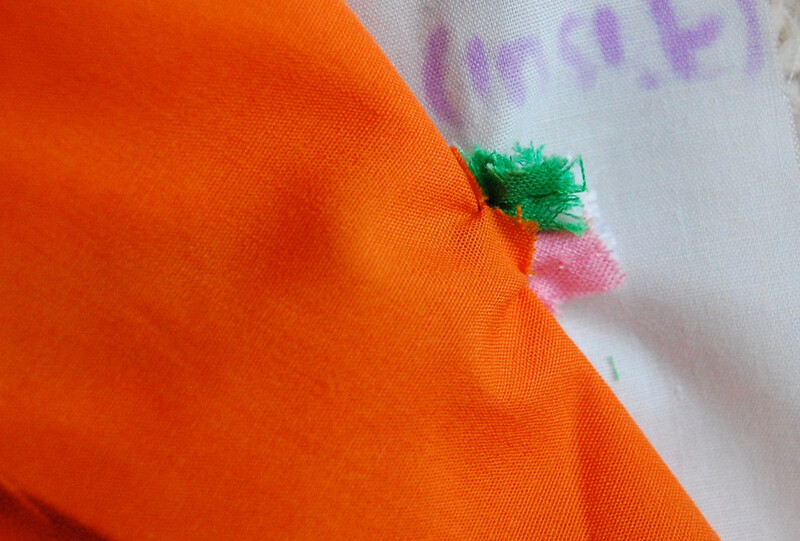 Fold back the garment fabric over the end of the pocket opening - remember that triangle? Also remember that the short sides of the pocket opening are not sewn shut so there is actually a hole between the layers? Push the ends of the piping through that hole (I used my seam ripper). 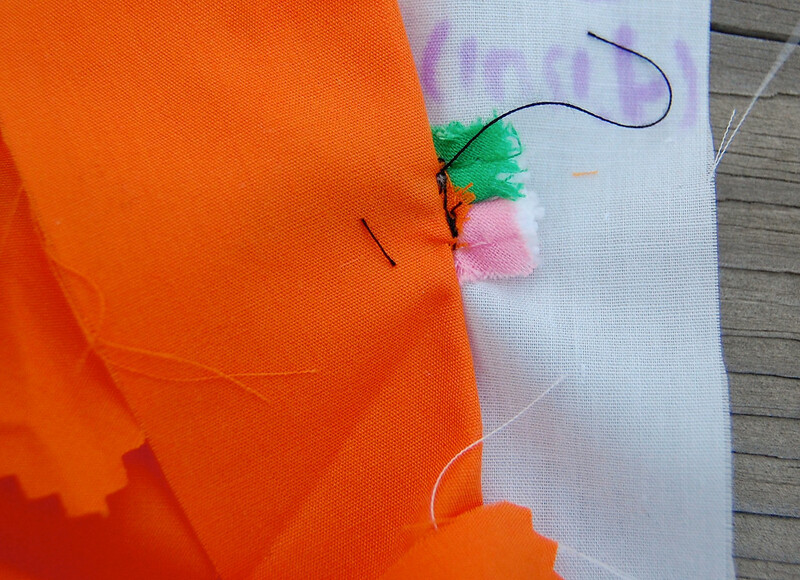 Sew down the triangle to the facing piece, trapping the piping ends in place. Repeat for the other side. Trim the ends of the piping to about 1/4"- 1/2". 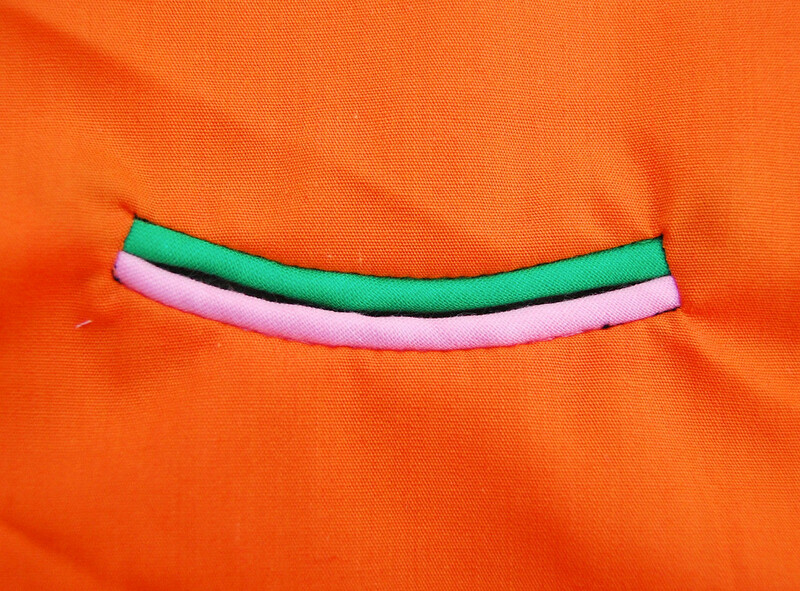 Behold - your piped welt pocket opening! Note - here's another one of my practice pieces to show you the outcome if you pulled your piping taut as you sewed it in Steps 3 and 4. Uneven tension of the piping causes gaping. If this happens, throw everything away and start again. There is no cure. This, fortunately, is peculiar to curved openings - it is less likely to happen if you are making a straight piped welt pocket - yay! 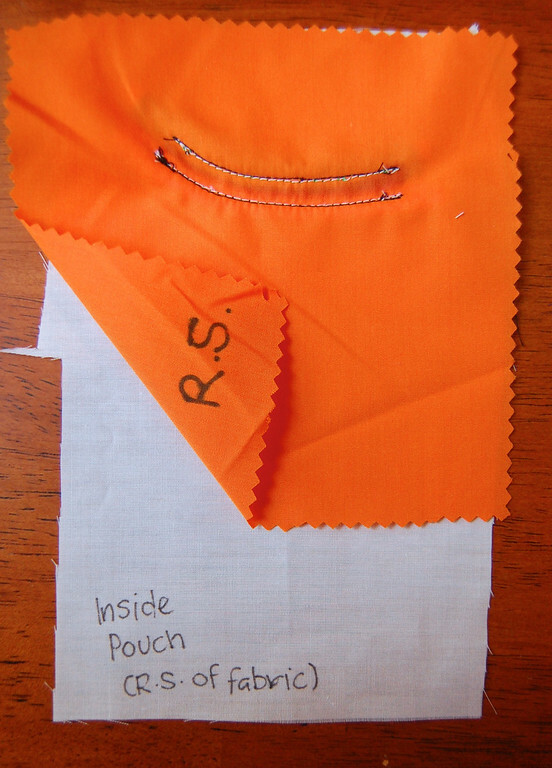 Back the pocket with the lining piece and attach it to the facing piece by sewing all around the perimeter. I used a long piece of fabric for the facing, and folded it up as the lining. 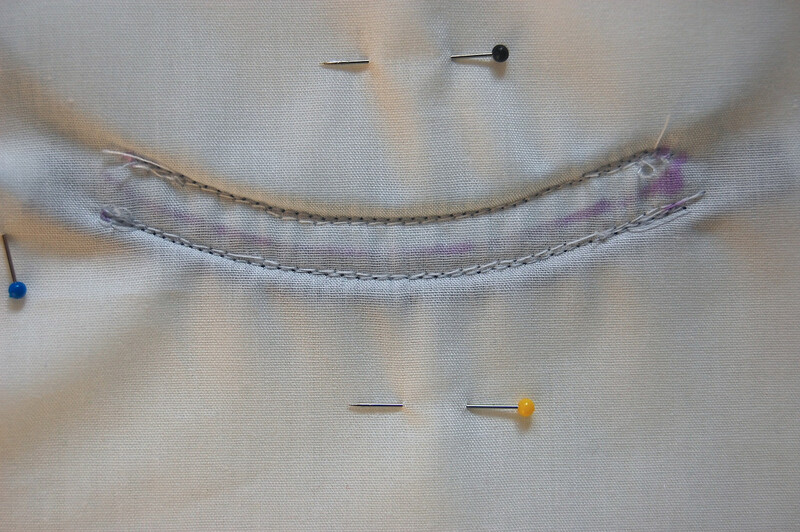 If you intend to add a buttonhole and button, do so before this step. Finished piped welt pocket with button and buttonhole. They are called arrow pockets in this catalog. 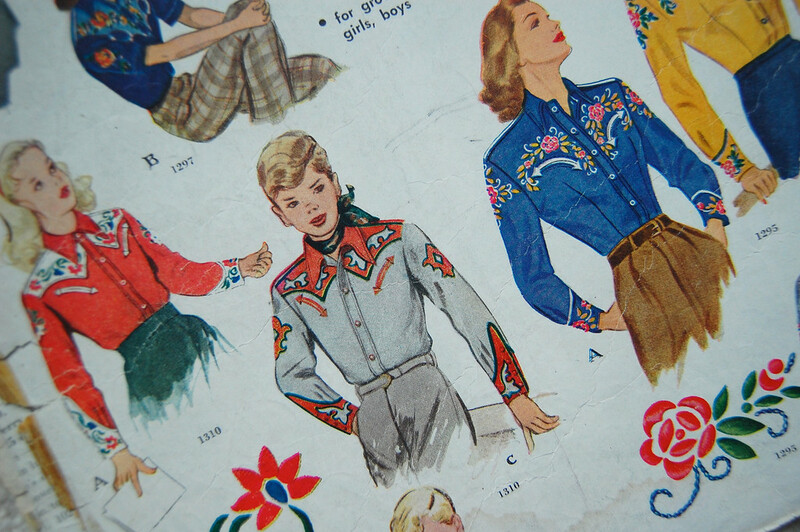 Coming up next: pocket on a slant, adding a flap and working with prints. Eek! Great tutorial, thanks! Just tried it out. In step 9, be careful not to tug the piping too taut again. Up to that point, my piping pieces were perfectly parallel - I promise! - but I pulled too hard on the piping in step 9 and made them gape. Next time, I'll pin baste the fronts together (particularly near the short edges) before sewing step 9. Very clear tut, thanks I needed that ! Thank you so much. I've never seen this more clearly explained. Just cruising pockets on Pinterest, and here you are. How much goodness can one human contain on one website on the Internets? And how grateful am I for your kindness and generosity. Hope spring/summer is treating you and the family well. 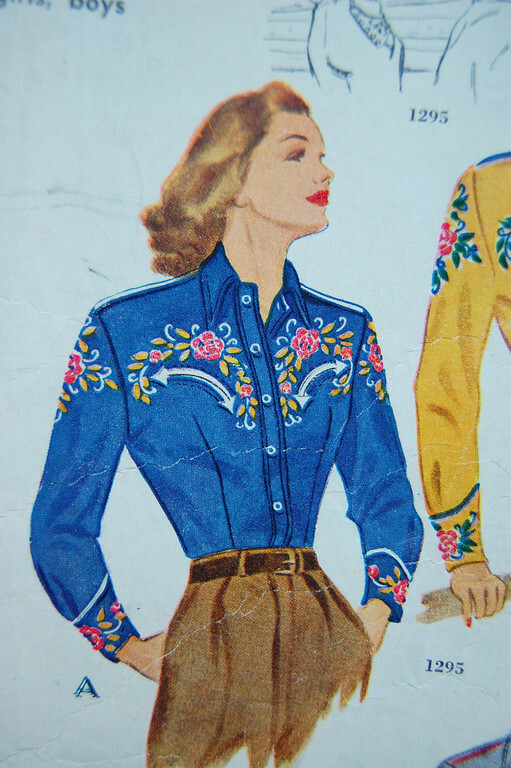 And my future western shirt thanks you, too.